So….my suggestion for a troubled news organization (yes, NBC) and I know this will rattle the old timers who have a fixated view about what journalism is..do something bold for 6 months and experiment. Put one of your strong and determined debaters on to host the nightly broadcast news, the new format, the 2015 one. And while you are at it, how about a woman? 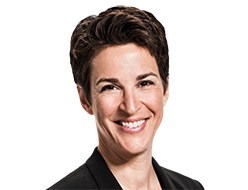 My suggestion: Rachel Maddow. Whether you agree with her or not, she will stir things up and provoke a debate. She is also the right price — she is already on the payroll! This entry was posted in Journalism and tagged Competitive Strategies, journalism. Bookmark the permalink.